My first Can Jam and my first headphone event of any kind so you had better believe I was there before a line formed. I knew what to expect, having seen videos of conventions such as this before on YouTube, but I also awaited the unknown. Since I started reviewing headphones back in March, I didn’t actually foresee a situation where I would be surrounded by fellow enthusiasts and those in the industry. Why I didn’t envision it, I don’t know. But I’m glad I bought my ticket to go. The event itself was held on floor -3, so the basement essentially, of the Park Plaza Hotel Westminster Bridge, a short walk from Waterloo Station in the heart of London. As I entered the area, my eyes went directly to the joint Cavalli Audio, MrSpeakers and Kimber Kable booth – fitting considering how much time I spent hanging out there this weekend. After meeting up with Cavalli CEO Warren Chi, I started my tour of the area. I have a Meze 99 Classic in silver and walnut and, in my review, I talked about how natural I found its sound signature – with its emphasis on bass and mids without choking the treble region. I found it similar to the ZMF Omni Cherry that I had at the time. Both headphones made acoustic guitars sound lifelike and natural to my ears, with the only major difference being how the more intimate soundstage on the Meze made the instrument a tad more immediate than the Omni did, and thus slightly forced. The Meze booth had several 99 Classics, but with different earpads than what I’m used to. One of the guys, Vlad, told me that based on some concerns collected from the community – they had decided that their next batch will have more space for ears to fit. As someone who has somewhat big ears, and as someone who felt just how hot and stuffy the old design could get (during a rare heatwave here), I definitely appreciated the new pads especially as they didn’t alter the sound. Another presence that caught my eye was the 99 Neo with its black plastic cups. The left side had a smooth finish while the right was rubberized so it’s safe to say that they haven’t decided which one to use yet. (I preferred the rubberized myself) They also had some IEMs that sounded a bit like the Meze 99 but with more treble on top. I didn’t have a long time with them, but I’d like to take a closer look in the future. Besides just the products, I found myself returning to the Meze booth to just hang out every now and then as I processed the event as a whole. They’d tell me their opinions on the other stuff on show, especially Vlad who was often seen trying out everything with even more fervent curiousity than I had for my first Can Jam. While I liked the rugged, industrial design (it’s made for studio engineers on the go according to the representative) – I struggled to hear a sound signature of any sort. I am partially to blame here, as I first tried it with my Sennheiser HD800 and found certain treble peaks being emphasized, quite similar to what my Schiit Magni 2 does when paired with it. I found a similar harshness with the treble using the Grado Allesandro Music Series provided at the table. 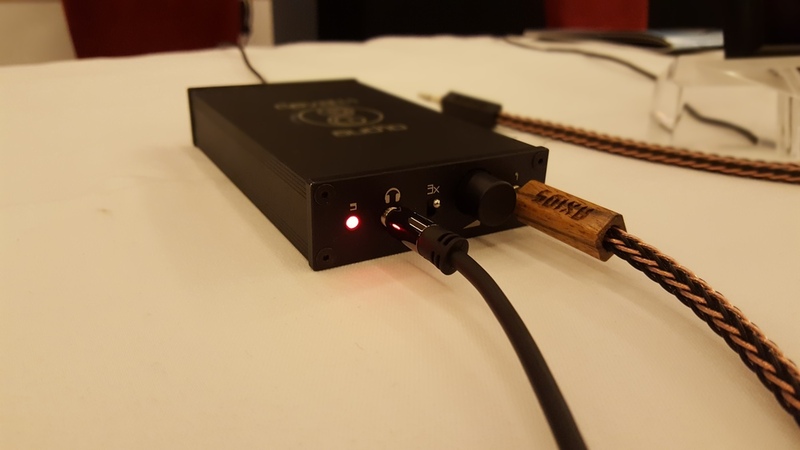 I found myself wishing I had more room in my backpack to have brought my Hifiman HE-500 along, but alas I walked away from the booth feeling that I had not been able to assess the amp properly despite two visits on two separate days. My only experience with an unmodded Fostex product before had been the few months I spent with the TH-X00. While the headphone overall was not to my taste, I did note its serious advantages over the competition in the sub-bass region. I had heard that the TH900 would take it a step further, but I didn’t hear it extend as much as the Massdrop exclusive even. This was quite confusing and I’m not sure if it was an isolation issue due to the large amount of people all around, but it just didn’t match what I had been once so used to – and that from a neutral/bright Magni 2 as well as the Cavalli Liquid Carbon and VE RunAbout Plus. The treble, which I had personally found problematic at times with the TH-X00, ran really hot – to my ears. It felt like a peak was constantly being reached, and I could not listen for very long due to it. Just not to my taste, I suppose. That all being said, the finish on it is a true sight to behold. I was told by the representative that the colour can be customized, as long as you purchase 100. A dealer in Russia had recently ordered 100 black TH900s and I pictured the silver flake finish and lettering on top of black and I imagined it to look quite breathtaking. The TH610 was a mellower affair, but once again I found that it didn’t quite reach the sub-bass level of the TH-X00. Once again, I liked how it looked more than how it sounded – with a detailed wood grain and dark walnut wood. The biggest praise I can personally give both headphones is that they have detachable cables – something absent from all the Massdrop editions. I would like to try them again someday in a quieter room with different amp configurations however. The DT990 600 ohm edition was my first over-the-ear pair of headphones that was not a gaming headset. It was the pair of headphones I owned when I first got my hands on a proper DAC and amp, the Schiit Modi and Schiit Asgard 2 back in 2013. I remember plugging it in to the combo and being amazed by the jump in sound quality from the Fiio setup I had previously. But, as years went on, I realized that the midrange was important to my enjoyment of music. This was especially made clear when I bought everyone’s favourite stepping stone (and to some, the endgame) – the Sennheiser HD600. Sure it didn’t handle bass as well as the DT990, and it had a slightly veiled treble compared to the sometimes shrill highs of the Beyerdynamic, but it presented a more complete musical experience to me. I’ve long since parted with the DT990, but I made checking out the update, the DT1990, a strong priority of attending Can Jam this year. Once I put it on, I reached for my Ibasso DX80 and plugged it into the provided amplifier. I immediately went for the Ride the Lightning album by Metallica, one that I always found particularly harsh on the DT990. To my pleasant surprise, it sounded completely right. They didn’t combat the old sound signature by throwing the treble extension into a ditch, but rather they brought the mids forward for a more lush musical experience. Keeping with their approach, the headphones come with two sets of earpads – one tuned for a more analytical sound and one for a more musical tone. You would not be able to tell from the cushioning, as it is identical, but rather from the design on the back side. I found myself really, really liking the new Beyerdynamic sound. It did not sound like anything else by them that I had first-hand experience with before. I only wonder how it will do in its price-range, as it is a $599 headphone. (According to the official North American online store) I also preferred it to the T1 at the same table, by a sizable amount actually. I’ll revisit this topic in a bit, but thank the stars for the Moon Audio booth – the most stacked booth at the show in terms of what it had on the table. I first heard the HE-1000 at Drew’s table and it sounded really smooth and dynamic from a tube amp he had. When I tried it at Hifiman’s own table, I didn’t understand what had gone wrong. There was some dodgy synergy with the amps and the headphones, in my opinion. Both didn’t sound as good as I knew they could. 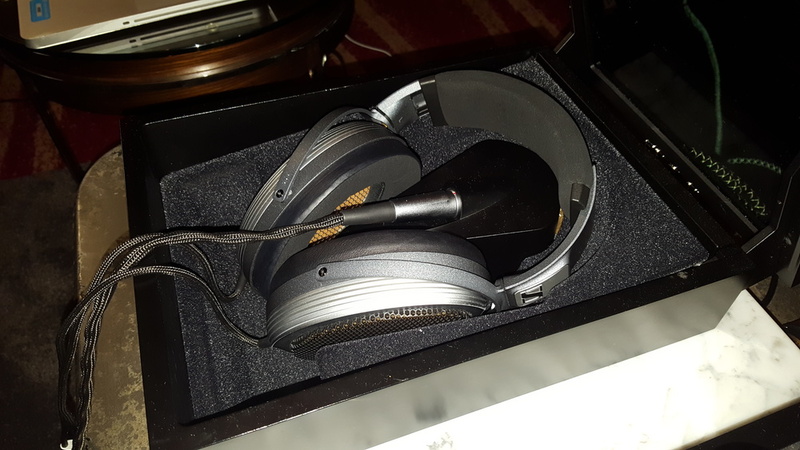 That being said, and like I said above, the HE-1000 had a very deep and rich tone to it – and was surprisingly a bit laid back compared to all other planars I have tried yet. I didn’t have much time with it due to wanting to try other headphones (kid at the candy store syndrome) but I appreciated what it did and would like to revisit it for a closer look. This could also be chapter one of “My Search for HD800 Synergy.” As I listened to the stock HD800 and HD800S at the Sennheiser booth, I really appreciated my Superdupont Resonator modded pair that I had in my backpack. The HD800 had that 6k peak everyone talks about, but the HD800S didn’t sound all that much smoother to my ears either in the treble region. This could be a characteristic of the Sennheiser amp being used, because I briefly borrowed the HD800 to use on the Cavalli Liquid Tungsten and returned it ten minutes later with my head swimming at the possibilities that existed – but more on that later. The HD800S was noticeably tuned to be less stark than the original could be at times. The bass was quite a bit more noticeable in tracks played at the Sennheiser booth, but it felt a bit less controlled than what I was used to with the HD800. This is a hard impression to put into words, but I felt that the HD800S had more body to it at the cost of being looser. That being said, I could easily see it being more compatible with a vast array of genres – unlike my HD800 with which (even with the mod) I avoid certain over-processed and electronic genres. Well, here it is – arguably the most hyped headphones of the event. Let me draw a picture for you, there were two Utopias and two Elears on the showroom floor – one each on two booths. Because of their presence, there was near-constant traffic at the Focal and Moon Audio booths as people lined up to see what the hype was about. I managed to get some time with both, admittedly more with the Elear but enough to understand and appreciate what was taking place with the Utopia. There is a natural nature to both headphones that is difficult to describe, it simply must be experienced. The Utopia especially chewed up acoustic guitars and spat them out in a manner as lifelike as the show floor could allow with all its ambient noise. There was detail-upon-detail-upon-detail, but it didn’t sound like anything in the highs was elevated to achieve this. Detail retrieval aside, both headphones were of an excitable nature, with bursts of musical notes in both instrument and vocal form hitting the listener in an impactful manner. The Elear had a slight peak in the highs with some tracks unlike the Utopia however. The bass on either was quite controlled and full but never reaching the deep region that my Omni and HE-500 can go quite easily, planar magnetic that they are. It’s hard not to talk about price when bringing up the Utopia. The new driver design took four years for the Focal R&D team to finalize, so it is an understandable statement price for high end and impressive audio. However, it seems to go a little further based on the usage of a certain raw material for the drivers themselves – beryllium. I don’t have much of a background in science so I’m not sure what the implications of using such a valuable material is, but it certainly adds to the cost. The Elear, however, is aluminium-magnesium. I kept catching myself considering if I could find a way to fit the Elear into my collection, I was that impressed by it despite having experienced the Utopia. The price tag puts a lot into perspective, and I bounced percentage numbers around in my head initially of how the Elear stacked up to the Utopia before I dismissed such thoughts as ridiculous. Both are great, that’s the bottom line, and take electrodynamic innovation further. That is always good for the industry as a whole. It has to be said though, I really wish I could have had a quieter listening environment. This headphone, which retails for £1300, would fare far better in the noise isolation department outdoors. It was indeed the quietest and most secluded listen I had on both days on the show floor due to a noise cancelling system that kicks in the moment you put them on. There’s a bit of tech built in, which the AKG representative happily explained to me, (he uses these on long flights as the battery life of a single charge is 15 hours) that scans your ear after you press down on a button. You hear a beeping sound and some sweeps as the drivers tune themselves to your ear shape. I played upbeat pop music through them and was taken aback by how, while it didn’t sound natural, it picked the detail in the vocal layering incredibly and presented it to me. Despite being closed, the soundstage was wide – which I chalk up to some clever engineering once again. (Like a certain other can that’s coming up) I switched to rock music, particularly Dream On by Aerosmith, and felt similarly impressed. Is it my preference for a headphone overall? Not really. But I’m not the audience. If you want to have the best audio quality possible during commutes/flights then this is for you if you are comfortable with the price. The neat bit of technology and electronics guarantees that aspect. I ended up spending a lot of time at the joint Cavalli and MrSpeakers booth. I pretty much had two anchor spots at Can Jam, their booth and the Meze guys. The reason for this is because I quickly found out that their new amp was almost exactly to my taste. Even before I picked up what they had on their tables (the MrSpeakers Ether Flow and Ether C Flow), I brought an HD800 over to the Liquid Tungsten prototype and was absolutely floored by what I heard. It emanated so much musicality yet detail that I was excited (although slightly dismayed, $5000-$6000 is way out of my budget unless I win the lottery) by the pairing. I have only had the headphones a few weeks now, but it became clear to me that this was the best pairing yet. I tried it on the Liquid Gold and, despite it being a huge step up from my Liquid Carbon at home, it still felt slightly lacking compared to the synergy with the Tungsten. I can honestly say that my search for HD800 synergy, to my taste, is over but not in a manner that’s affordable to me. It is, absolutely, very nice to know that there is potential in my headphones that can be unlocked by gear out there. The Liquid Carbon made an appearance, albeit a first run one with the internal power unit replaced with the second run one. The issue with the first run was the hum that was present, quite audibly on 3x gain, with low impedance IEMs, earbuds and headphones using the ¼ / SE output. However, I quickly learned once I bought mine many months ago that the Carbon isn’t meant to be used with its SE output – it’s just a bonus feature. The real selling point is the balanced output that provides far more juice and is how the amp is meant to be represented. The Liquid Spark was also present, albeit in a shell that made it look like a mini-Carbon that is going to be replaced with another design soon. I tried it with my 320 ohm VE Zen 2.0 earbuds and found that, while it didn’t output as much power as the VE RunAbout Plus and needed me to turn the dial up quite high, it definitely had the Cavalli house sound. The Liquid Gold, unfortunately, wasn’t available for use the second day due to a power issue but I did have some time with it on the first day, but the Tungsten kept catching my attention and I returned to it with a certain headphone (not the HD800) in hand because it provided such immensely good synergy and fell almost directly into the target of my taste in personal audio. The Ether C Flow and Liquid Tungsten pairing were my favourite of the entire show. I found it to be more to my liking than the Ether Flow + Tungsten or even both Ethers + the Liquid Gold. This pairing was the reason I kept eyeing the Cavalli + MrSpeakers booth to see if it was free before descending upon it like Batman for another listen. Luckily, they had Tidal available so I had access to a lot of lossless files. I went from Beck to Alice in Chains to Kanye West to Vivaldi and it all sounded incredible. When I told Dan that the sound seemed to come out so effortlessly, he told me that yeah “it flows.” Understanding the meaning of the name, I saw how the gap of transients and speed between a planar magnetic and an electrostatic was being bridged by Dan’s design. After I interviewed him about it, he apologized for getting too technical – but it was what I wanted to hear. Once again, I reiterate that I have no foundation and background in science – but it sounded like quite an achievement. I preferred it, paired with the Liquid Tungsten, to the Focals but I concede that I did not give the Utopia the proper listen that it deserves – with my own music and a quiet room. Also, the Ethers are the lightest planar magnetics I’ve ever put on – a far cry from my Hifiman HE-500. Even the Focals, with their incredibly thick cables, are quite heavy by comparison. So, just to confirm it in writing: The Ether C Flow + Liquid Tungsten prototype was my favourite sound at Can Jam London 2016. Like I mentioned earlier, the show was all held in the basement of the Park Plaza hotel. The only exceptions were for the really high end stuff that you need an appointment for. I made mine several weeks ago to see what the Orpheus is all about. Even climbing the stairs to reach the second level just for the Orpheus felt like there was a message behind it. You had your time and you supposedly ascended to higher plane of existence where it was quiet and there was a waiting room. I made small talk with the Sennheiser employees before walking into the room to claim my 15 minute slot. Luckily, Tidal was set up so I could search for anything I wanted to hear. I saw that the last person had listened to the Jurassic Park soundtrack and the recent searches were mostly for classical music. No way Jose’, I thought, if I’m only getting 15 minutes then I’m listening to something I know inside and out. I want to hear the difference. And I did. There’s a term called air around the instruments, something high end DACs and headphones strive to achieve. The HD800 is particularly good in this regard, but quite bright for the effort. The Orpheus was not bright at all. It reminded me of the warmth of the HD600 but with far, far more detail. It was an extremely analytical sound smashed with a degree of warmth and musicality that I did not know was possible to achieve before. The soundstage was narrower than the HD800 however. The first song I chose was When Doves Cry by Prince. I knew that I wasn’t going to be able to lean back and listen to entire songs in these 15 minutes so I had to skip to the parts that I predicted might sound interesting. Indeed, I heard the slight breaths Prince took in the recording studio before singing each line and I heard how his vocals were stacked on top of one another so effortlessly. The warmth made it so it sounded like he was in the room with me, which would have been cool but sadly not possible anymore. I switched to Closer by Nine Inch Nails, an aggressive song that gets very harsh on analytical headphones and needs to be dulled a bit to sound fun. The Orpheus did away with such notions of trade-offs and presented the whole package to me in a manner where it was almost unsettling. There are certain synth lines that get buried under layers of other, more distorted synth lines and guitars in that song that were brought out and made to ring clearly. I ended my listen with some Pink Floyd songs and was, once again, taken aback by just how effortless and natural the sound was. As I walked back down the stairs to the rest of the attendees and booths, it dawned on me what the Orpheus really stood for and why it made its appearances at shows. Somewhere down the line, in 1991 apparently, Sennheiser ran really far ahead of everyone else and took a look back and thought that they could release it as a statement, an achievement showing what was possible. I don’t think that they thought they would sell very many, but it’s a genius marketing tactic to have limited 15-minute slots for enthusiasts to sit in waiting rooms for a chance to experience the pinnacle of your engineering. It sends a message. I found myself wishing I could have tried the Focal Utopia in a similar, extremely quiet setting with comfortable leather chairs and dim mood-lighting – with Tidal instead of their limited song choices at the booth. It does not matter which I like more, both are unattainable for my budget – but I honestly feel that the gap Sennheiser had in 1991 is lessening each year even with the recent update to the Orpheus. Time will tell what happens next, but I did feel that the Utopia deserved a quiet listening environment to shows its true strengths. Can Jam was just really fun. I approached it with an open mind, even checking out certain booths that would make a certain part of the community shake their head, and walked away having learned something – either confirming a product’s power or showing its shortcomings. Keeping an open mind is essential in this hobby so you need to take the first step to learn more. As the elevator door opened at the ground floor, I was startled by how bright it still was outside at 18:30. I should not have been surprised at all, but it felt like time stood still down on the Can Jam floor where you are absolutely surrounded by your hobby and interest in an area where you can’t see the outside. The area was more than just a basement rented out to hold a two-day event, it was a place many enthusiasts gathered to openly discuss and audition gear they were passionate about. Let’s be honest, the “audiophile headphones” hobby is still something that is not quite understood by the population-at-large, so I would urge you to attend any meets or events that you can within reason because you just learn so much and it’s as effortless as the audio reproduction of the highest-end headphone to be able to strike up a conversation with someone there – all because you have a shared hobby.